Today we are releasing a new beta with another two of the most commonly requested features: HIGHLIGHTING and inline document previews! You'll see the highlighter tool in the Note Editor toolbar and your most common office documents will be shown inline in your notes with search highlighting. We've also fixed a lot of common bugs too. Get it here: http://evernote.com/download/get.php?file=PrereleaseMac Enjoy! Thanks for spelling highlighting correctly Jack. Sounds like a great Beta Jack! Highlighting has been one of my long-time requests. - Only yellow rgb(246, 238, 150)? - It doesn't match iOS. One of you needs to change, and I think the exclamation mark in iOS is the least intuitive. 1) Yellow would not be my colour of choice. Options would, as always, be great. 2) Consistency between platforms? You're crazy! But, okay, let's run with it and be wild: How about the striketrough icon in iOS makes its way to the OS X editor too? Powerpoint and Word inline displays seem to be running well. Excel XLS files display as a blank area, and XLSX just shows as an attachment. What would be cool is a little application icon in the top corner of the display of the Office doc, so you can tell at a glance if you're dealing with a Word, PPT, Excel, or PDF file. They all display the same way, and you have to right click to tell a PDF from a Word doc or PPT doc. What is the installation procedure for the Beta? I'm currently running the latest production ver 5.1.4. Do I just move the Evernote.app to trash and then open the Beta DMG, or is it more complicated than that? I got it just by checking for updates (make sure you have the beta box ticked) - didn't need to get it from Jack's link. That's not working for me. I had tried it previously before my prior post. I tried again AFTER quitting Evernote (including the menu bar), double checked beta box is checked, but still no joy. Running Mac OS X Mt. Lion 10.8.4. You can just quit Evernote and the Helper, then overwrite the app in your /Applications with what's provided at the link above. Thanks Jack, that worked fine. Thank you so much for adding the Highlighting tool. After basic font type/size, and then bold, this is the text tool I use to most often. Make sure nothing is selected, then click tool or SC key, then apply highlighting to one or more blocks of text by click and drag. As far as the highlight color goes, the dark yellow will work OK, but it is not my favorite, and it is a very non-standard highlight color. But if you would like to provide a superior, more user-friendly, highlight tool you could offer a choice of colors in a standard set, as well as a user-selected color from a color wheel. The tool button is a classic drop-down button with the color being the currently selected highlight color. Click on the drop-down arrow displays the list of available standard colors, as well as a button to "Other..." which allows the user to select any color from a color wheel. While I would definitely be satisfied with your current implementation, I would be elated with something like this. I also think it would be well received by most other users. I do hope the other users here will comment on this design. For already existing notes with office documents attached the inline view would not automatically open...just after clickicking on the attachments. For newly created it works fine..
your most common office documents will be shown inline in your notes with search highlighting. Very nice to get inline Word docs. Thank you. However, I am not seeing the capability to search within these docs. When I try a search the Word docs do not show up in results, and there is no highlighting within those docs. OOPS. COMPLETELY FORGOT ABOUT THE 'FIND WITHIN NOTE' COMMAND. Been a bit off-color the last few days. Brain not the sharpest. The problem is rather an iOS issue. When these Word docs are opened on my iPad they are not searchable in-note. Hope this changes soon. Tested the beta version, but I still have incomplete results from saved searches (http://discussion.evernote.com/topic/38550-incomplete-results-from-saved-searches-since-evernote-51/#entry208595), which is very, very annoying. Highlighting is absolutly great for students work. And yes: some colors more would be very, very good, because my students use always differnt colors for differnt passages. Hope so much that this feature will finde its way to the new Windows-Evernote-Version ...! I doubt it will appear in Windows for a while. My theory is that the Windows team ticked off Jack sometime last year, so he has dedicated his life to making them look bad and bring down the wrath of the Windows user base on them. All of these years complaining about lack of parity hasn't got us some of the old stuff (sort options), but it has gotten us the new stuff (Reminders, etc.)! At the next ETC (Evernote Trunk Conference) I expect Jack to walk on stage, say "Evernote v6," drop the mic, and walk off. On the screen will be Evernote with sharable tags, sharable stacks, selective sync, black on white text, and searchable / manipulable related notes. The Windows folks in the audience will collapse in shame, pull out their iPhones, and order Macbooks on the spot. I have previously filed a bug report on this. It seems to happen if an iWork document has been saved in iCloud first. I am getting mixed results. Some Excel files display inline properly, but I have at least one file which shows up blank. I see nothing unusual about this file. It shows properly in preview from Evernote. Highlighting is absolutly great for students work. And yes: some colors more would be very, very good, because my students use always differnt colors for differnt passages.Hope so much that this feature will finde its way to the new Windows-Evernote-Version ...! I doubt it will appear in Windows for a while. My theory is that the Windows team ticked off Jack sometime last year, so he has dedicated his life to making them look bad and bring down the wrath of the Windows user base on them. All of these years complaining about lack of parity hasn't got us some of the old stuff (sort options), but it has gotten us the new stuff (Reminders, etc. )!At the next ETC (Evernote Trunk Conference) I expect Jack to walk on stage, say "Evernote v6," drop the mic, and walk off. On the screen will be Evernote with sharable tags, sharable stacks, selective sync, black on white text, and searchable / manipulable related notes. The Windows folks in the audience will collapse in shame, pull out their iPhones, and order Macbooks on the spot. Has there been any word yet on the next ETC? Should be coming up in August right? I like the auto-preview feature, but I'd prefer to turn it on when I need it. I might have a note with 15 attachments, and each time I click on the note it has to render previews of 15 files. Really slows down use. I'd rather they be icons like before, and let me turn on preview for the ones I need. And especially since most of my attachments are XLS, they are all black white boxes right now! I might have to go back to the non-beta version until this is addressed. Michael, you can adjust the default settings for how documents are displayed in the Evernote preferences under "Clipping"
At launch, we will support whatever Quick Look handles natively. An iWork document can be saved either as a 'package' or as a single 'file' (the default is 'file'). iCloud can only save docs as 'packages', while Evernote only allows 'files'. 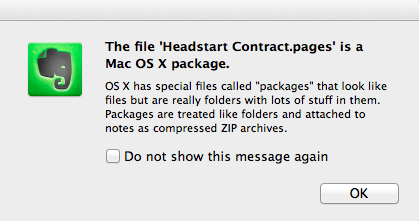 AFAIK, an existing document can't be converted from a 'package' to a 'file'. You'll have to create a new doc and use copy/paste. I wish the Evernote app's error message was clearer. I also think the error messages in Evernote (in several places) could use some fine tuning. I have not been able to "convert" a file this way. In my experience, once it's been saved to iCloud, the only way to save it to Evernote later is to copy/paste the content into a new file. When you know about this limitation it is not too restricting, although not optimal. But you are forced to make a choice between iCloud and Evernote. It should be easy. You duplicate the file, save it, and you'll be asked where you want to put it. When you save it to your local drive, the "tef" package extension is removed from the title, and it is saved as a regular file. I will test it later today within an Evernote account to see if it gets properly indexed. Technically speaking, because you duplicate the file (File > Duplicate) it isn't saved into the cloud yet, so you are correct. But, the process is relatively easy for individual files. The system is bizarre and annoying (thanks Apple), but workable on a small scale. But that is not what you suggested in your initial post (namely opening it and saving it to your harddrive). Making a duplicate this way is basically the same as opening a new file and paste the content. My bad. I skipped the step. That is why I said you were correct. As you know, Apple has a bizarre aversion to "save as," which is essentially what the duplicate feature does. I should have spelled that out more clearly in my initial post. The point is that if you have an iWorks document in the cloud, there is a method for getting that data into a regular file that can be put into Evernote. Personally, I think it is clunky, but that is on Apple. Apple does a lot of things well, but I don't think this is one of them. Apple haven't removed Save As, they've just hidden it. Bring up the File menu and then press the option key. You'll see the 'Duplicate' menu item becomes 'Save As…'. This works in most Apple Apps. But, I don't even know what to say about this. I didn't think Apple removed it. I thought their designers had some bizarre understanding of how stuff works in the real world outside of 1infinite, and they purposefully refused to put in a useful feature in order to be different. This seems even worse -- a great feature is designed, put into the app, hidden, and then overlaid with another feature. Why not have them both? This is even more bizarre than my initial thought. Funny. I didn't even know that trick. I just started to hate Keynote since there was no Save As. Thanks! I felt the same! I use Pages (syncs with iPad and has full footnote editing), but I've been frustrated for years about the lack of a Save As. It never occurred to me to search for it on the Internet, because it was clearly not in the menu. However, I just lacked imagination -- what's to stop the developers at Apple from hiding stuff? They hid my Library, but I knew that was there, so it couldn't stay hidden for long. Maybe there are a bunch of other features they have developed but are keeping hidden -- we've never seen them, so we never know to look. I say all this being a big fan of most Apple products (and owning most of them LOL). Even with brilliant UI/UX designers, there is still an important role for end-user testing. Sorry for the diversion. And now back to your regularly scheduled programming . . .
Good point. I can think of many other examples. The relevance to Evernote is pretty clear (in my opinion): Evernote needs blog posts / screenshots / videos showing how to take advantage of their new (and old) features. Within the video, if you showed how to Save As (you don't need to make a big deal of it, but as long as it is there, people will at least be able to discover it), then users could actually take advantage of this stuff. There are a lot of other educational opportunities to keep the team occupied for a long while. Once they are up there on the site, bloggers (me) could link to them, and so could forum members. The word spreads, people use it, and you have fewer cases of users getting frustrated when things don't work (not Evernote's fault, but Evernote will get blamed). They hid my Library, but I knew that was there, so it couldn't stay hidden for long. You will now see the Library folder as visible in your User folder, and you can slide that Library folder into the Finder Sidebar for easy access. Thanks! Whenever I set up a computer I go to Finder > Go > ~/Library > drag folder into sidebar. I'll try your method next time. It's good to know all this stuff. Can you think of anything off the top of your head that is hidden, but that I might not know about, because most people don't even know it exists? Nothing comes to mind, but then again, that might just be because I don't know about it! I suppose a lot of people don't know that they can run OCR on a PDF in one user profile, and then open another profile to use Adobe Acrobat Pro just like normal. Usually, if you run OCR with the program, it won't let you open up any PDFs until it finishes the process, but this way, you can OCR twice as much stuff at once (if you want), or make sure that the processing doesn't interrupt your work. Yeah, this is probably not a common use case, and not terribly useful to most people here. However, it is the only hidden thing I know (not really hidden, but a kind of workaround). Can you think of anything off the top of your head that is hidden, but that I might not know about, because most people don't even know it exists? Nothing comes to mind, but then again, that might just be because I don't know about it! Here's another good one I recently came across. To view info on multiple folders in the Finder in one inspector pane, select the folders and hit Cmd Ctrl I . Brilliant. That is quite helpful. Many of my office documents don't appear - they still only appear as attachments. Some I can right-click and say "View Inline", but many do not have that option. What are the rules to determine if a document can be viewed inline or not? New created notes only show the office document as attachment. No "View Inline" options available.